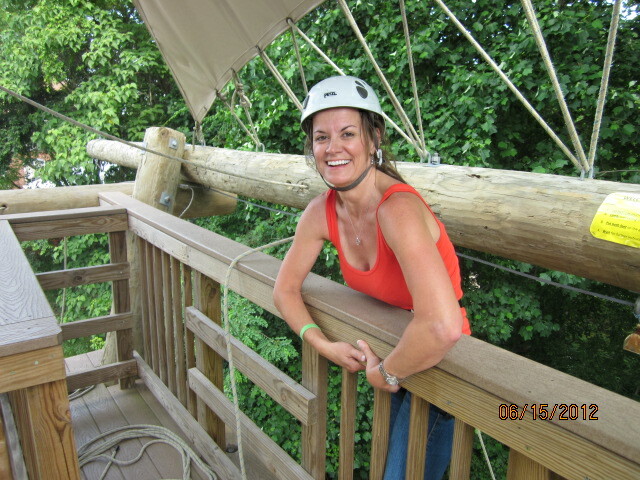 If you have any questions about our High Ropes Challenge Course, please call Terrapin Adventures at 301.725.1313. Everyday on our course we have guests dozens of feet in the air mumbling to themselves under their breath. Among some choice expletives we often hear “who came up with this idea?” and “why am I doing this?” While that moment is rarely the right time to share the answer, now that you are all comfortably seated it seems like as good a time as any. Our high ropes course is the brain child of our Chief Adventure Officer and my wise (and hopefully reading this) employer Matt. His dream took flight amongst the tree tops while zipping through Costa Rice, but ropes courses have an old heritage. Cargo nets and climbing ropes have long existed as training tools for militaries but most hold that the first civilian course came to the United States with Outward Bound. The origin of Outward Bound ties the “who” to the “why.” Outward Bound arose from a problem observed in WWII. The British lost hundreds of transport ships, and an odd pattern emerged with the survivors. It was not the young health sailors that tended to survive in the water and life boats but rather the older grizzled sailors. It was soon realized that the experience of having survived incredible hardship and uncertain odds trumped youth as a predictor of survival. To counter this problem a brilliant educator , Kurt Hahn, founded Outward Bound as a civilian school to train maritime personnel. His school aimed to prepare sailors for the worst challenges of life. Students pushed their limits on a high ropes course, in the mountains, and in the sea. It is here that the “who” meets the “why” for those climbing on our course. While fun trumps all other reasons to join us, somewhere driving most people is the desire to test their limits. Everyday we see guests take one step beyond what they thought they could do. Which brings the question to mind, what are your limits? Terrapin Adventures is conveniently located in Howard County, Maryland, between Baltimore and Washington DC.All aerial adventures are led by our uniquely trained guides who are all about making sure you have a great time while you learn about our environment and learn new skills. Helmets and harnesses are provided. Get in touch with a Guest Relations Specialist today and ask about how we can help you plan your event. In the meantime, if you have any questions about our High Ropes Challenge Course, please call Terrapin Adventures at 301.725.1313, email us at info@terrapinadventures.com, or fill out the contact form on our website. You can also follow Terrapin Adventures us on Facebook, Twitter, LinkedIn, YouTube, Google+, and Pinterest for up-to-date information on events, trends, and other fun and exciting outdoor activities. This entry was posted on Friday, March 15th, 2013 at 1:00 am. Both comments and pings are currently closed.